Wild Oak Tree Service, LLC. Trees are a beautiful and irreplaceable landscaping feature. Patios, decks, walkways, and any number of landscaping projects can be completed in a few weeks. Trees take years to grow. If you have a tree in your yard, it's usually in your best interest to keep it healthy and well-groomed. Tree service most often entails trimming to promote new growth in a healthy and healthy-looking tree. In some scenarios, however, homeowners wish or find it necessary to have a tree removed from their property. Whether you need tree maintenance or tree removal services, here's what you need to know, and what you should expect from your Austin tree service professionals. Snide comments aside about trees having more rights than people, you probably suspect, and rightfully so, that you'll need to obtain a permit to have your tree removed. Nearly all metropolitan areas have tree regulation ordinances, and you should expect nothing less from one of the most environmentally conscious cities in the U.S. The City of Austin Tree Regulation Ordinance stipulates that you must obtain a permit to remove a tree larger than 59.5 inches in circumference (as measured 4.5 feet from the ground). You do get a freebie if the tree in question is dead, but don't get any ideas. Arbor homicide is a punishable offense as well. If you live outside of the Austin City Limits, your tree permit regulations may differ slightly, but almost everywhere has some form of regulation. Of course, besides the fact that you should never, ever tackle a project like this on your own, your Austin tree service contractor should be able to take care of the permit process for you. While felling a tree is no simple task, the vast majority of problems homeowners experience in dealing with local contractors involves what happens after the tree is gone. Be sure to clearly spell out with your contractor your expectations for cleaning up branches and debris from your yard. Many homeowners find the best solution is to have the tree and its branches chopped up and used for mulch. You'll also want to make sure your contractor is able and willing to remove/grind the tree stump. Of course, if you're able to take care of these post-construction services on your own, the cost of your project may be substantially less, but homeowners are frequently frustrated by miscommunication about the level of these post-construction services. More pleasant tree service typically involves tree trimming. 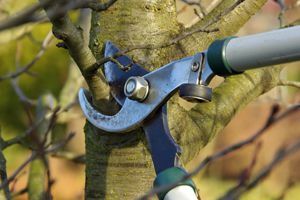 This, obviously, is something you can tackle on your own, but many homeowners find it convenient and otherwise beneficial to hire an Austin tree service contractor to maintain and trim their trees. Tree professionals naturally have the necessary equipment to reach even the tallest of trees. More than this, however, these professionals have the expertise to know exactly where and how to trim to promote new growth and a beautiful-looking tree. In fact, in this area it's usually a safe bet to trust your contractor. This is what one Austin homeowner had to say about his tree trimming project: Don't worry if you think that your trees look a little thin when they are done. The crew knows what they are doing. Three days after the work was done, I saw new growth in the tree tops. They were already starting to come back to life after struggling for so long. As far as cost goes, it's nearly impossible to estimate without knowing the details of your project. HomeAdvisor tracks all sorts of home improvements, including tree service in Austin and around the country. We can tell you that tree service jobs in Austin have ranged from as low as $150 to well over $1,000. More than simply the scope and size of the project, Austin homeowners noted the wide range in price quote among different companies. Again, however, make sure you're comparing the same level of services when receiving quotes from different companies. Comment: Fairly large dying Arizona Ash tree needs to be cut down and removed from front yard. Comment: Recent storms have blown down tree branches that need to be hauled away. The remainder of the tree needs to be cut down. New Heights Tree Service, Inc.
Austin Tree Services are rated 4.80 out of 5 based on 1,077 reviews of 81 pros. Not Looking for Tree Service Contractors in Austin, TX?